— J. Marvin Herndon, Ph.D.
What makes these scientific revelations so explosive is the source — J. Marvin Herndon, Ph.D. Not only has the highly experienced and well-regarded scientist utilized rigorous scientific methods to arrive at his firm conclusions, the research paper has been published in a prestigious, peer-reviewed open access journal. The International Journal of Environmental Research and Public Health has in fact permitted the publication of many highly consequential research papers over the years. 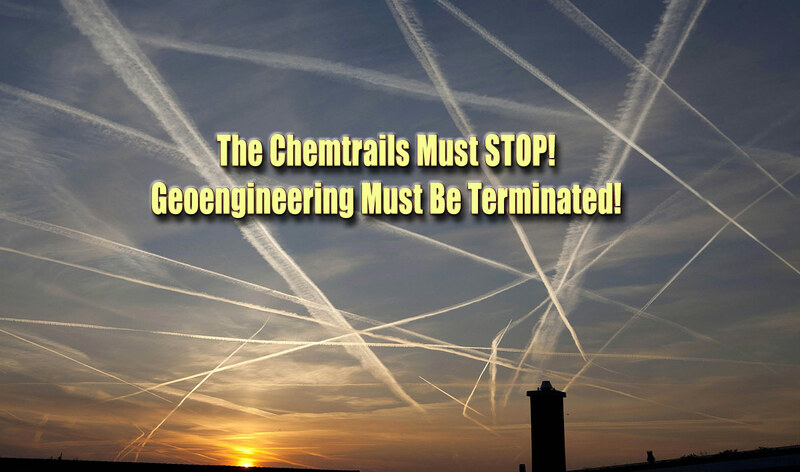 However, this particular scientific study on chemical geoengineering is as serious as it gets. Which begs the question: Just who is J. Marvin Herndon? Marvin Herndon is no ordinary geophysicist. According to his Wikipedia page he has been dubbed a “maverick geophysicist” by The Washington Post. It is his extraordinarily diverse background, deep and broad knowledge base, as well as unique skill set which distinguishes him from his peers. In order to better know the source of this critical information, regarding the ongoing and nationwide covert geoengineering program, PhD Herndon’s wiki-profile is presented below. 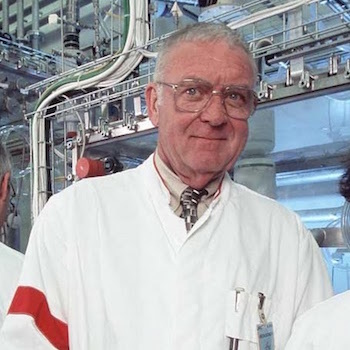 J. Marvin Herndon (born 1944) is an American interdisciplinary scientist, who earned his BA degree in physics in 1970 from the University of California, San Diego and his Ph.D. degree in nuclear chemistry in 1974 from Texas A&M University. For three years, J. Marvin Herndon was a post-doctoral assistant to Hans Suess and Harold C. Urey in geochemistry and cosmochemistry at the University of California, San Diego. He is the President of Transdyne Corporation in San Diego, California. He has been profiled in Current Biography, and dubbed a “maverick geophysicist” by The Washington Post. He is most noted for deducing the composition of the inner core of Earth as being nickel silicide, not partially crystallized nickel-iron metal. More recently, he has suggested “georeactor” planetocentric nuclear fission reactors as energy sources for the gas giantouter planets. as the energy source and production mechanism for the geomagnetic field  and stellar ignition by nuclear fission. With credentials like these, it will be very difficult for the U.S Federal Government to deny the fact that toxic Coal-Fly-Ash is being systematically used in the now ubiquitous geoengineering program that generates chemtrails on a regular basis around the world. Dr. Herndon’s exceptionally thorough and authoritative paper goes on to state the following about these toxic and/or poisonous components found in the chemtrail aerosols. The preceding excerpt reveals that whoever lives, works or plays under chemtrailed skies is exposed to a whole range of chemical contaminants and toxic pollutants. Therefore, the longer those individuals (read: every resident of the USA) are exposed to such chemtrail aerosols, which eventually fall down to Earth, the more likely they are to be directly involved in this developing public health disaster. 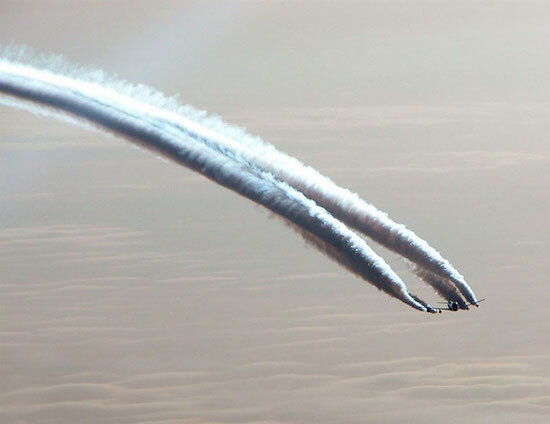 For those who are unaware of the chemtrail phenomenon, please view the following comprehensive photo-doc. Should any questions or concerns arise about chemtrails or chem-clouds, geoengineering programs or chemtrail operations, please watch the videos posted here and here. There are many other medical ailments and health conditions which are caused and/or exacerbated by chemtrail-disseminated coal fly ash and their other toxic contaminants. 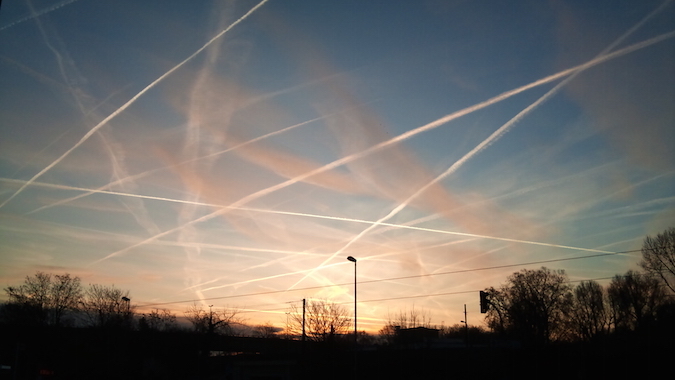 There is even a quite common illness that is now well-known as Chemtrail syndrome which is further explained at the link below. Just what is coal fly ash and what does it contain? Industrial coal burning produces four types of coal combustion residuals (CCRs): fly ash, bottom ash, boiler slag, and flue gas desulfurization product (FGDP), i.e., gypsum. Bottom ash is heavy and settles out; coal fly ash, on the other hand, is comprised of micron and sub-micron particles that would go up the smokestack unless captured and stored. Because of its well-known adverse environmental health effects, Western nations now mandate that coal combustion fly ash is to be captured and stored. The research paper introduction goes on to explain the “potential environmental health risks” that are associated with the many trace elements which are concentrated in the coal fly ash repository. Some of the more toxic and/or potentially poisonous elements are “arsenic, barium, beryllium, boron, cadmium, chromium, cobalt, lead, manganese, mercury, molybdenum, selenium, thallium, thorium, vanadium and uranium“. Why the EPA would permit the indiscriminate, systematic and wide-area spraying of coal-fly-ash based aerosols containing arsenic, lead, mercury, thallium, thorium and uranium is anyone’s guess. Such a practice is in direct violation of so many EPA rules and regulations that it certainly defies explanation. The results of two different test methods, both of which compared the composition of the aerosolized particulates with the known elements from coal fly ash, were not just compelling, they were overwhelming similar. That virtually identical results were arrived at provides an excellent legal basis for class action suits to proceed successfully. Both individuals and families, communities and businesses, which have been injured by ongoing geoengineering operations, now have sufficient scientific evidence to sue the government for both compensatory and punitive damages. The results show: (1) the assemblage of elements in rainwater and in the corresponding experimental leachate are essentially identical. At a 99% confidence interval, they have identical means (T-test) and identical variances (F-test); and (2) the assemblage of elements in the HEPA dust and in the corresponding average un-leached coal fly ash are likewise essentially identical. 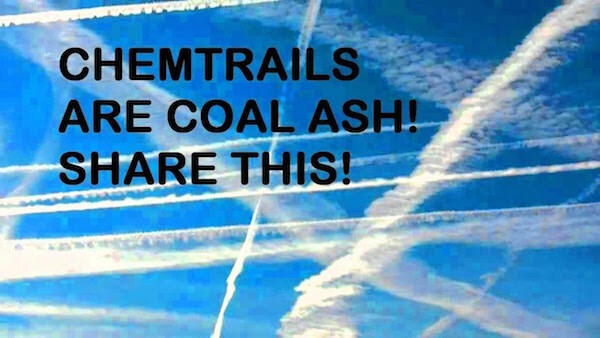 Given the information which has been presented thus far, who in their right mind would not want to immediately get to the very bottom of how this extremely hazardous waste product — Coal Fly Ash — is being SPRAYED IN OUR SKIES ON A DAILY BASIS! Now many will better understand why so many health advocates and environmental activists within the anti-geoengineering movement believe that the geoengineers are truly mad, or clinically insane, or certified crazymakers, or all three. Who but mentally incapacitated geoengineers would ever implement such an exceedingly dangerous and destructive atmospheric engineering program? Across the planet, no less! This toxic/poisonous chemtrail pollution is now constantly permeating the air that we breathe — all of us. The coal fly ash falls on the water bodies and water courses of the world. Coal fly ash now rains on the crops and the orchards and the grain fields below. The coal fly ash descends on the forests and fields, the cities and suburbs. The toxic chemtrail brew ends up on our homes, our lawns, our vehicles and our previously organic gardens. In light of this ever-worsening predicament, one question emerges. How do we stop this slow-motion genocide? Michael J. Murphy, Producer/Director of Why in the World are they Spraying? is initiating a class action lawsuit which addresses the damaging effects from the ongoing, worldwide geoengineering programs. He has been informed that a scientific, peer-reviewed research paper on geoengineering process and procedure, aerosols and their chemical composition will have sufficient legal weight in a class action lawsuit. This irrefutable evidence will be presented in Michael’s upcoming documentary An Unconventional Shade of Gray. A class action lawsuit will surely bring to light many of the facts and figures that Mr. Herndon has meticulously ferreted out and confirmed. Through the legal process of discovery the government agencies, military installations, and corporate contractors, which directly participate in this crime against humanity, will be forced to disclose their many closely-held secrets. The following link provides more information about what a class action lawsuit initiative might look like. The bottom line here is that “NATIONAL SECURITY” will no longer prove to be an acceptable justification for poisoning the skies of the world. That is exactly what the U.S. government and military will invoke — ‘national security’. They are used to getting their way — every day — over many decades by committing their many crimes against humanity in the interest of ‘national security’. The following article presents firsthand testimony about how well this strategy has served their covert geoengineering programs over decades. Times have now changed … profoundly. Many are now waking up to the serious medical consequences that Dr. Herndon has identified. When the health of all human, animal and plant life have been placed at great risk, something radical must be done about it. Clearly, the implications of the Herndon study are so vast and grave that the American people must respond appropriately. For starters, perhaps they ought to consider how to peacefully militate — POST HASTE — against all geoengineering programs which spray chemtrails. Doing so “post haste” is highly recommended because of the current international push to legalize geoengineering as a means of combatting global climate change. Should sky chemtrailing become unlawfully legalized by international treaties or legislation, the challenge of undoing those measures will be formidable. As the following article indicates, the upcoming December 2015 climate conference in Paris is an important milestone in their drive to legitimize geoengineering worldwide. 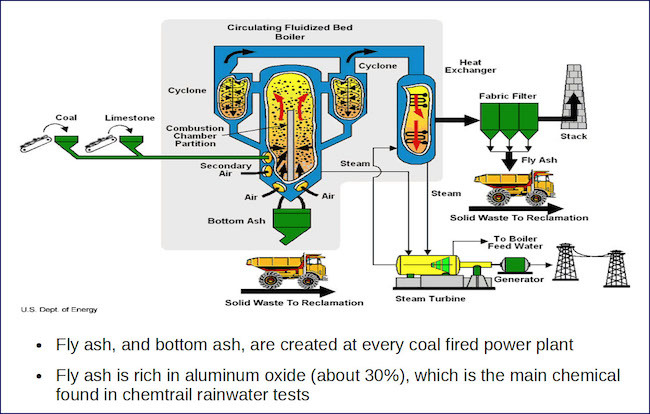 *“COAL ASH”, as seen in the above photo, is a generic term for Coal Combustion Residuals or CCR. Coal fly ash, also known as “pulverised fuel ash”, is one of the primary residual waste products generated by coal-fired power plants. Hence, Coal Ash often refers to any of the 4 main hazardous waste products produced by burning coal, including coal fly ash. When scientists like Marvin Herndon risk their careers, their reputations and even their lives in order to reveal the details about highly classified geoengineering programs, it’s time to rally around them and support their efforts. Marvin’s paper is 1 out of only 2 peer-reviewed scientific research papers ever written about the connection between geoengineering and environmental contamination. He wrote them both. Because they are peer-reviewed, they can be used in a court of law with great effect. They can therefore be used in a class action lawsuit. Marvin is collaborating with other scientists in an effort to get more tests and peer- reviewed papers out into the public domain. In those future studies they will endeavor to prove the direct correlations between chemtrail contaminations and other diseases/ailments/conditions. Aluminum-related illnesses are of particular interest to these courageous investigators. So are other known toxins and their health complications which are now frequently showing up in human populations everywhere. For more info and future updates, please go to: ChemtrailMustStop.com. This chemical geoengineering exposé is so explosive that it will surely come under all sorts of attack. Ad hominem attacks in the form of baseless claims are usually the first type of criticism to be leveled. In the interest of further solidifying Dr. Herndon’s credentials to expertly investigate chemtrail composition, the following excerpt is offered for the reader’s consideration. The Geoengineer PhDs are especially dangerous and deadly in their doings. This particular piece deeply penetrates the existing institutional arrangements and pervasive ‘political correctness’ which have created an environment for so many scientists to do things which are relentlessly destroying the biosphere. So many among us have misplaced their trust in exceedingly misguided scientists and their destructive junk science. The aforementioned commentary lays bare how the whole corrupt academic and scientific research system really works. Hence, the unbeliever(s) ignores this crucial info at their peril. Dr. Herndon has obviously escaped that same system. Not only does he run his own company, he appears to enjoy a high degree of investigative research license. In other words he can investigate serious matters which the system scientists are forbidden from doing. For this reason Marvin Herndon deserves every form of material and spiritual support. Whether it is his stated cause or not, the research mission he has embarked upon is nothing less than saving humankind from certain self-destruction. After all, what is more essential to life — vital to human existence — than the very air that we breathe … 24/7 … everywhere and anywhere we go?